Do not confuse these with SKETCH or CIAO markers. 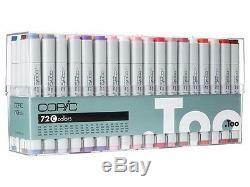 Copic Classic Markers 72 Color Set C. Copic 72 Color Set C - Completes Copic marker 214 color range. Supplemental set of 72 colors, with an emphasis on Gray values and colors used in. This set contains the following colors: B18, B21, B24, B41, B45, E00, E02, E21, E35, E39, E41, E43, E51, E53, E55, E57, E59, E77, G00, G05, G09, G12, G14, G19, G20, G24, G40, G82, G85, BG11, BG32, BG34, BG45, BG49, B12, B16, R59, YR02, YR16, YR21, Y08, Y19, Y23, Y38, YG05, YG07, YG09, YG11, YG21, YG25, YG41, YG45, YG63, YG67, BV04, BV23, BV31, V12, V15, V17, RV02, RV10, RV13, RV21, RV25, RV32, RV34, R00, R05, R11, R24, R39. There's nothing like the Copic Original double-ended marker for expert blending, painting, and tone control. Use them for fine art projects, calligraphy, and more. The broad nib offers coverage for larger areas. For detailed work, flip over to the fine nib on the opposite end of the marker. Nibs are replaceable for unlimited creative options. The item "Copic Classic Markers 72 Color Set C" is in sale since Tuesday, February 09, 2016. This item is in the category "Crafts\Art Supplies\Drawing\Pens & Markers". The seller is "otakufuel" and is located in Sunland, California.